The durability of glass can be witnessed in most cities with ancient churches. Unless broken by excessive loads glass will remain for very long periods. The glass may be pitted by the weather but still it provides service through the centuries of use. The early producers of glass treated the production like alchemy but modern glass is fairly uniform and the properties governed to provide consistent performance in use. Apart from mechanical stress there are only a few factors that damage glass. Abrasion can cause glass to scratch and remove any exposed applied coatings. Sand borne in the wind may be a natural phenomena but it is rare for this to cause major damage. Most examples of damaged architectural glass is the effect of handling, up to and including glazing and thereafter, following trades. Unless the glass surfaces are protected the final clean down can reveal deposits from cement and plaster products. The attempted removal of the products with scrapers or grit being picked up in cleaning cloths can cause abrasion. Chemical attack is also not a common natural event. Clean fresh water is not a threat to glass but acid rain may have a long term effect. Glass is good at resisting most acids with short term exposure. Alkaline products can attack the chemical composition of the glass surface. Alkalines are found in cements and so the contamination of the glass during the building may lead to damage unless it is immediately removed. The water runoff from new brick work or concrete across glass may also contain enough alkaline chemicals to cause attack manifested by streaking on the glass surface. Pitting of glass can be caused by weld splatter from tools used on building sites. The hot particles either fuse into the surface of the glass or fall off leaving a dimple. Old glass i.e. pre modern volume production may show signs of pitting due to years of exposure to water. The chemical constituents of glass have to strike a balance between the required properties of the product - resistance to chemical attack, strength, melting temperature and hardness (workability). Under the section on strength of glass we discuss its unusual properties. In terms of mechanical strength the durability can be variable. The theoretical strength of glass is extremely high but we are unable to realize the full strength. From the moment that glass is made it is handled by machinery etc. That effects the surface of the glass in a way not visible to the eye alone. Minor flaws on the surface allow stress to concentrate so under load the glass will break from an imperfection. The lack of resistance to a break means the crack can grow until it is obvious. In our calculations we allow for the impact of the flaws and design around the lowest strength. The larger the piece of glass the chances of finding a critical flaw increase. Glass can withstand loads applied at rapid rates better than the same load applied over a longer period. Glass suffers from stress corrosion. At the tip of a flaw in the glass there can be a chemical reaction with the atmosphere. The moisture in the air reacts with the sodium to sharpen the crack tip. With a sharper crack tip the stress is concentrated increasing the risk of failure. The potential for stress corrosion is related to the time it is exposed to the load. Fortunately, the relationship is predictable and calculable using the stress corrosion constant. Glass with holes and notches create localized areas where stress is greater under load. Where these features are necessary in glass it is important to have a radius in the corners to try and reduce the stress concentration. Anyone who has plunged a glass into very hot water may recognize that glass does not like sudden temperature changes. It is surprising how hot glass can get in service. 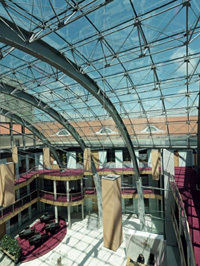 Solar control glass with high absorptancy rates can get hot very quickly when exposed to the sun. It is not the absolute temperature that the glass reaches that can create a problem. With modern glazing materials and even some old ones the glass at its edges can remain from overnight quite cold compared to the center of the glass. A rising sun at a low angle can heat the glass at the center before the edges can catch up. Design features like overhangs or even adjacent buildings can throw shadows across the glass adding to the potential problem. The hot glass tries to expand while the cold glass around the edges is not expanding. The stress created around the edge can lead the glass to crack. It is the temperature difference from one area to another that is the critical factor. Once the crack has started it often meanders across the face of the pane because the initial high stress has been relieved. Applying finishes to the glass alters the surface and can change the frequency of occurrence of critical flaws. The edge of the glass is prone to damage often in a more visible way and can lead to stress concentrations.